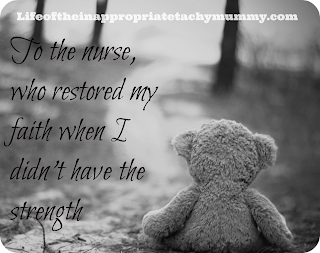 life of the inappropriate tachy mummy: To the nurse who restored my faith when I didn't have the strength. 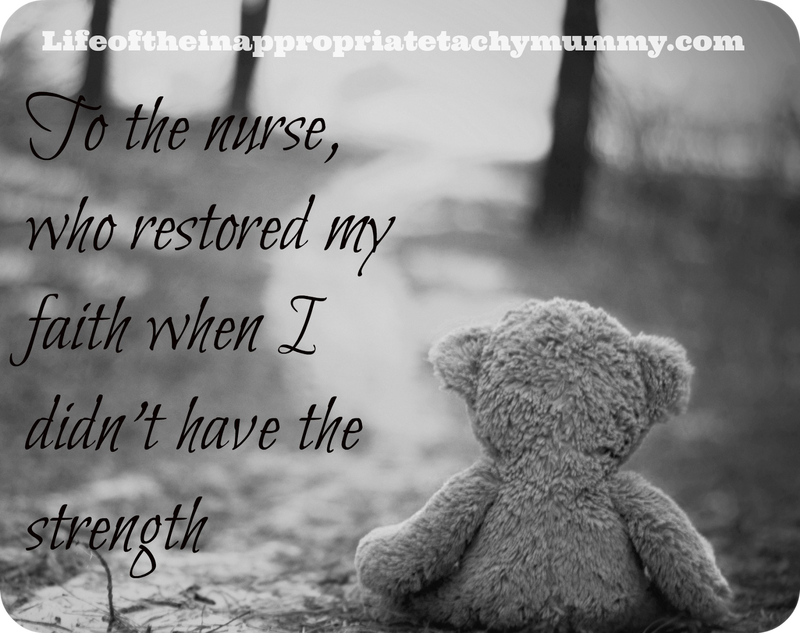 To the nurse who restored my faith when I didn't have the strength. 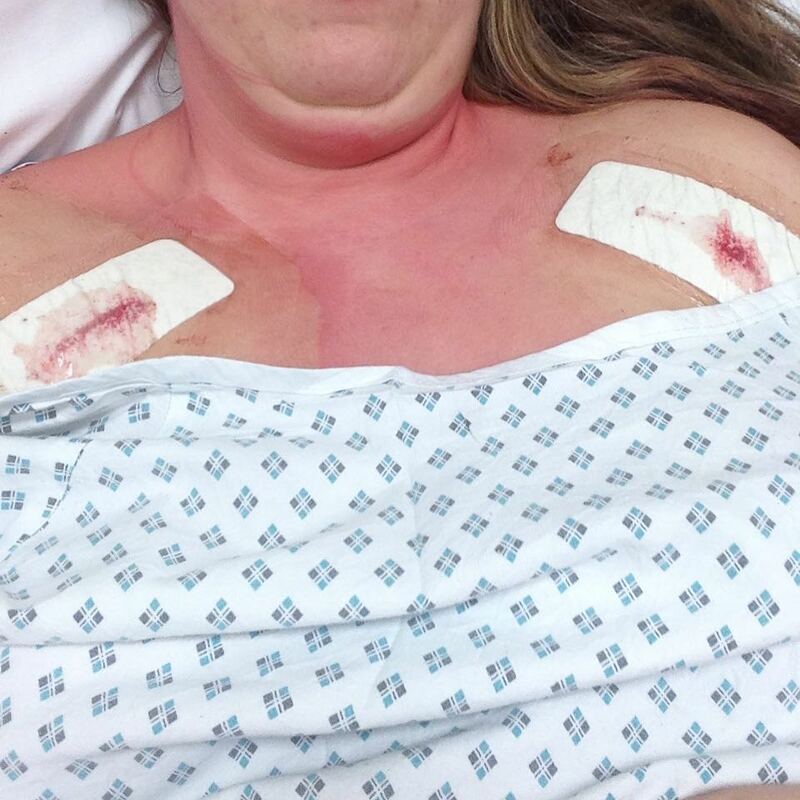 You didn't really know me, you came through the ward door onto a night shift and all you knew was the basics that the nurse before had handed over, as you shouted up the large ward that had been full and busy with people all in for different reasons they had all been and gone there was just me and another 2 old ladies left. At first you frightened me, with your high pitch loud voice shouting 'I don't know if your in pain you have to tell me' I buried my head into the pillow as you grabbed the blood pressure machine to check my blood pressure, I didn't speak to you I simply smiled, you seemed rude, scary, one of they horrible nurses that everyone hopes isn't looking after them, the sort of person I would avoid like the plaque and I wrongly judged a book by its cover. You see I have spent a lot of time in hospital, meeting endless doctors, nurses receptionists the list goes on, but they treat you and look after you as a number on there list of patients, I mean you can't ask for more can you ? their all doing there job rushed off there feet with small breaks in between, stressed exhausted, longing and counting down the hours for their shift to finish to get home to their own life. Maybe it was your voice that made me judge you or your attitude I don't know, or the way you walked around, I was sore yet to scared to say anything to you as you muttered away to yourself making up the beds for the next day. I was to scared to be an inconvenience. As I lay there, you knew I had just had my pacemaker removed and a new one implanted but what you didn't know was really how broken hearted I was, that I was missing my little boy who I had left behind on so many occasions with no choice, as he would wave goodbye to me it killed me inside that I was his mum and I wouldn't see him for a few days I felt like a failure, like I was letting him down, forever left wondering would I miss the first word he ever said, did he miss me at night ? Did he wonder why Mummy was always sad and not around much , that I cried myself to sleep every night I had been in hospital which had become my second home, grieving and longing for the life I used to have, or the tears I shed after every soul destroying moment that I was told my heart couldn't be fixed but they would try again, but that try again was always just a try and that try kept turning into a fail, the jealously I felt just wanting to be like any other 25 year old, I would be reminded as my facebook feed filled up with pictures of my friends and work colleagues out enjoying themselves I felt forgetting about that invitation out with them turned to a quick text after a while that text turned to nothing, loneliness filled my broken heart that I would forever be the one who is always too sick to do anything, my birthday was just 2 days before and instead of celebrating I was consumed with sadness knowing I would be spending it in hospital and spent the next day packing my hospital bag, you didn't know that I had been through what felt like hell and back again, that my heart was now damaged beyond repair, that I was the girl who if you held my hand or touched my shoulder you would feel how heavy the weight was, the anger sadness and frustrating eating away at ever last piece of me that didn't already feel broken. But what you didn't know was that how a random act of kindness made me feel that little bit better, you restored my faith during what was a really horrible time for me . As you seen me lying there you noticed my pillow and sheets was soaked and covered in the cleaning solution, mixed with dark spots of stained blood, my own blood were just a few hours before I had lay before being put to sleep praying and hoping I would wake up to the same pacemaker and that it wouldn't come to it being took out and I wouldn't be met with a new horrible scar and a new pacemaker all that hope had been shattered just a few hours before, I mean I owe my life to this little piece of machinery propelling my heart to beat so you could question was it such a big deal ? but it was it meant another couple of weeks of being pushed further back from were I had wanted to be .My long brown hair was stuck together and painted red, you helped me up to the chair striped the blood soaked bed as you muttered away some more and said 'everyone who's unwell needs a clean fresh bed', you were just doing your job but not only did you give me a fresh clean bed you guided me to the toilet that was close yet felt so far away walking and standing was a challenge, I was sore and tiered and didn't care how I looked but you sat me down and washed my hair despite how busy you were you didn't give me the option to lie down and sulk about it all, telling me how can you feel your best if you don't look it.You guided me back found my pyjamas helped me out of the horrible hospital gown and tucked me into my clean fresh bed turning the lamp above my head on, and wished me good night. I hadn't had a good sleep for weeks before hand, everyday had been another long day spent worrying, undergoing tests hoping it wouldn't come to my pacemaker being removed so soon, and that just maybe this one more course of antibiotics would kill the infection that had struck and was slowly taking over my tiered body and this whole nightmare would be over, or that before my pacemaker I would wake up during the night gasping for air struggling to breath because of my heart pausing or beating too slow,or the times my husband would shake me violently to wake me up as I was yet again having another nightmare were all the difficult times would flood back to me. I would be frightened even though I struggled and it was a fight to keep my tiered eyes open I would lie awake scared in case my heart did pause and never unpause again forever wondering if I would make it through the next day the next hour without that faint happening just scared of the unknowing but that night I slept like a baby, all my fears were washed away like the blood and dye you had washed from my hair. 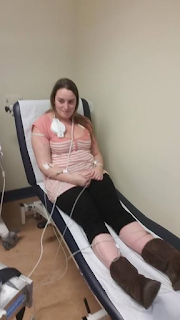 Maybe you seen through the fake smile as I had smiled as you took my blood pressure, maybe you had even been there yourself, but you took that few seconds to notice despite how busy you were. You did make me look that little bit better which made me feel a million times better . And that simple act of kindness of washing my hair tucking me in and wishing me good night made that horrible day and few weeks that little bit brighter and for that I am forever grateful and from the bottom of my broken heart thank you for restoring my faith and washing my hair when I didn't have the strength to wash it myself.